Paracelsus is the latinized pen-name of Philippus Areolus Theophrastus Bombastus von Hohenheim. Swiss physician and surgeon, philosopher and theologist, metallurgist and alchemist, magician and scientist, travelling medicine man and father of the science of pharmacology. He was a contemporary of Rabelais and Ulrich von Hutten, and Crowley considered him to be an Adeptus Exemptus. He abandoned his academic studies and began a series of very extensive travels, collecting medical anecdotes and folk remedies, treating the sick, and conducting medical and alchemical experiments. He travelled all over Europe, and visited the holy land and Egypt. He even travelled to central Asia: while staying with the Grand Duke of Russia, he was captured during an invasion by the tatars and taken to their capital. He combined the information he compiled on his travels with the theological doctrines of Duns Scotus and Nicholas de Cusa, the magical teachings of Trithemius (see below), the Christian Qabalism of Giovanni Pico della Mirandola and Johann Reuchlin, and the theories of Alchemy to synthesize a completely new view of medicine. He rejected the Galenic theory of illness as a result of conflicts among the “four humors,” and the ideas that health and disease are determined by astrology and the influence of saints and demons. Paracelsus placed no reliance on “supernatural” forces in his work. To Paracelsus, magic meant the use of natural forces which were not yet completely understood. He developed the novel conceptions that the human body is an organic, self-constituted, sovereign whole, and that it is subject to the same natural forces to which animals and plants are subject. His idea of treatment was that the doctor assists the body to heal itself through its own natural healing processes, which ran against the conventional wisdom of the time which was that the doctor had to overcome Nature to achieve healing. He founded the science of chemical pharmacology, divorced psychology from theology and demonology, and did pioneering work in the fields of occupational medicine, psychiatry and gynecology. He discovered zinc; the idea that herbal medicines contain active principles is his; and he coined the terms “chemistry” and “protoplasm.” He also contributed the aspect of “salt” to the alchemical/philosophical theory of the three alchemical principles, salt, sulfur and mercury. Having established his medical techniques and theories, he proceeded to promulgate them, severely attacking medical orthodoxy where ever he went. He obtained several decent positions during his lifetime, but due to his lack of formal academic credentials, his arrogance, his lack of patience, his coarse manners, his association with people of the lower classes, and his lack of social and political skills, he always ran afoul of the local elite and was soon forced to flee, despite his remarkable successes with his patients. 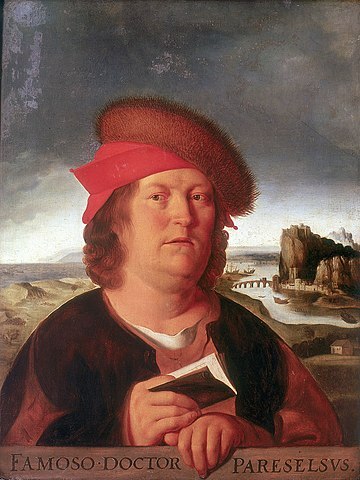 Later in life, after the collapse of the Reformation, Paracelsus underwent a conversion experience. He began to re-evaluate his natural philosophies in terms of religion, and rejected much of it as incompatible with his new religious feelings. He remained a Catholic, but rejected much established Catholic dogma, such as the ressurection of the flesh and the immortality of the soul. His religious philosophy was that of the simple life, with salvation secured not by works or by faith, but by love. Still later, he reconciled himself with science, and published his great synthetic treatise Philosophia Sagax. Even though he was able to reconcile himself with science, he was never able to bring together the two souls of God and Nature which dwelt within his breast. The sword of Paracelsus was taken up in earnest after his death, and the established medical orthodoxy soon crumbled. His followers soon established their own orthodoxies in his name, some just as irrational and ineffective as those he had fought against. The memory of Paracelsus is revered by chemists, physicians, philosophers and occultists of all stripes as a courageous pioneer and soldier in the army of Truth. Modern occultists who revere Paracelsus should always keep in mind that he was the sworn enemy of the superstitions of his day. It is the task of the true occultist to constantly challenge orthodoxies and superstitions, never to buttress or coddle them. The major works of Paracelsus include A Book on Nymphs, Gnomes, Giants, Dwarves, Incubi and Succubae, Stars and Signs (1515), Archidoxa Medicinae (1524), Volumen Paramirum (1525), Intimatio (1527), Diseases Which Deprive Man of His Reason (1528), Paragranum (1529), Eight Books on the Origin and Causes of the French Disease (1529), Opus Paramirum (1530), Invisible Diseases (1531), Great Surgery Book (1535), Philosophia Sagax (1536), Seven Defensiones (1538), The Doctors’ Labyrinth (1538), and Prognostication for the Coming Twenty-Four Years (1538). Originally published in Red Flame No. 2 – Mystery of Mystery: A Primer of Thelemic Ecclesiastical Gnosticism by Tau Apiryon and Helena; Berkeley, CA 1995 e.v.